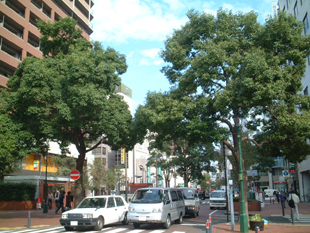 In Yokohama-shi, there is roadside tree (sidewalk row of trees and other Takagi) more than 130,000 now. For more details, please see page of kind of roadside tree. Roadside tree has various roles. It is useful for something like bottom mainly. We make tree and shut out summer hot sunlight. Temperature cools down by transpiration of leaf. We attach color to cityscape and bring united feeling of town. We let you feel seasonal change. We purify air by adsorption to leaf of breathing of plant and air pollution material. We take in carbon dioxide (CO2) and create oxygen (02). It shades the light by headlight and prevents revolt crossing of walker and helps road safety. We prevent collapse of spread of fire and house of fire at the time of earthquake and disaster and help disaster prevention. We go about maintenance of roadside tree including the pruning and pruning of tree in each ward engineering works office. ※In addition, please refer to each branch office (the jurisdiction comes close to place) of Yokohama national highway office (the outside site) for roadside tree of national highway. Maintenance work such as the pruning and pruning of tree going routinely, weeding or mowing of tree planting zone depends on "roadside tree management business". In addition, we perform following special business and approach. It is roadside tree business lively ・・On line that we chose in each ・ ward, we make beautiful shape of a tree and rows of trees. Roots above ground measures of roadside tree ・・We repair the sidewalk by method in consideration for root of ・ tree. Supplier that roadside tree maintenance business consignment is carried out look at the following page. When we perform maintenance and own expense construction of roadside tree, as for the company, please see the following page. We introduce representative roadside tree of Yokohama-shi and the history. Basyamichi ・・It is the modern roadside tree birthplace of ・ Japan. 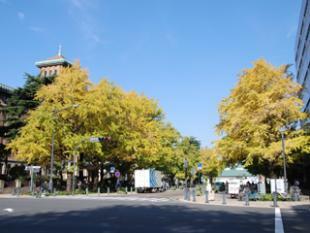 Nihon Odori Avenue ・・There is big ginkgo row of trees on the first Western expression street in ・ Japan. Yamashita-koen-mae ・・It is sightseeing spot representing ・ Yokohama. We made "Kannai Sakura Dori Avenue" others of Naka Ward with many inquiries, roadside tree map of cherry tree in Kannai-District. When you see Q&A about roadside tree, representative question and the answer are compiled.